US Social Forum: Another World is Possible and Teens Will Lead the Way – Direct Action Welfare Group Inc. 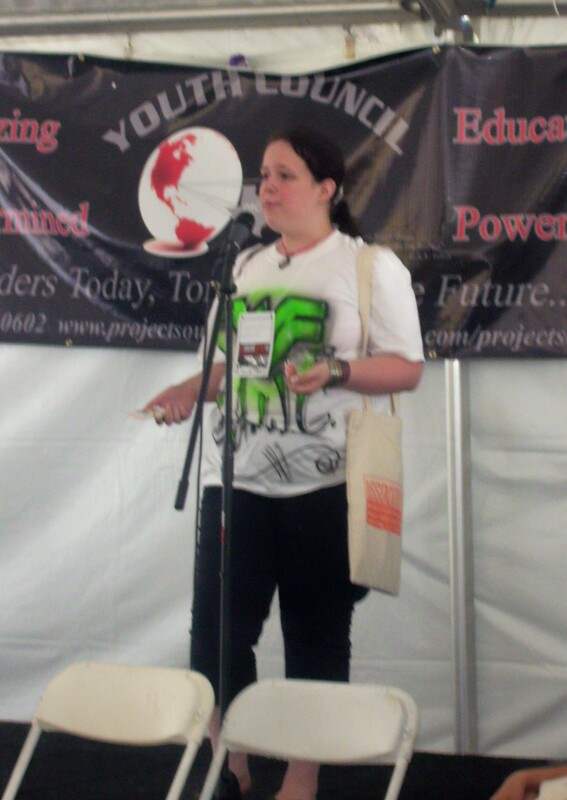 I am Beth, Teen Coordinator for Teen DAWG, which is a project of Direct Action Welfare Group . I found out about the USSF and wanted to go. So I spoke with the Director of Direct Action Welfare Group, and told her that I would love to attend the US Social Forum. She told me if I found an adult DAWG member willing to go with me then I could go. I of course wanted to know why I couldn’t go on my own and she said “You can’t just send a nineteen year old girl from rural West Virginia to something that big alone.” So she talked with Sondra, Treasurer on the DAWG board, about me wanting to go. Sondra immediately said she wanted to go too. Prior to the US Social Forum, I went to Philadelphia with Evelyn to meet with American Friends Service Committee (AFSC) and speak about getting more youth involved in their work. Evelyn talked to AFSC about how she was trying to find funding for me and Sondra to attend the US Social Forum. Since we are the only poor people’s group in West Virginia, we felt it was a necessity for us to attend. AFSC decided to help us by giving us the majority of what it was going to cost for us to go. The Appalachian Action Coalition and individual donors gave us the rest. Thanks to them we got to go to the very first USSF, had a roof over our heads and we had money to eat everyday…Only one thing when were we going to eat or sleep? There was so much going on, so many people, a lot of workshops, a ton of activities and marches. I lived off of coffee and what ever I could grab and eat on the go. I learned very quickly that trying to eat something that requires silverware and running to catch the MARTA train to the next workshop doesn’t work well. For the entire week we got up at 6am, showered left our hotel, caught a shuttle bus to the airport got on the MARTA and went to our first workshop. Then we had to run back to the MARTA to get to the next workshop and returned exhausted late at night. After trying to find a computer and blog every night onTeen DAWG’s MySpace , I would go up to the room and crash into bed at about midnight if not later and get up the next morning and do it all again. We were lost all over Atlanta and they ain’t lying when they call it Hotlanta it’s really hot there. I went to a lot of workshops. One really sticks in my head. It was by the Welfare Queens. They are amazing. They tell their stories in a way that will get anyone’s attention, keep it and even after they are done you will think about it forever. They taught me to tell my story in a new more powerful way. I plan to teach the teens I work with, here in West Virginia, how to tell their stories. Because telling your story is one of the steps in the revolution and the teens of today will be the ones leading the revolution of tomorrow. If you ever get the chance to go to a workshop or performance of the Welfare Queens(Youtube) go its well worth it. I met a ton of interesting people working on all kinds of different issues, such as poverty, anti-war, and immigration. There were tons of youth groups and organizations talking about teen issues too. I even met some people talking about the revolution and I don’t mean the one when our country was born. I mean the one that is going to happen that will change the world as we know it. The revolution is already in the beginning stages as we change policies and speak out about the injustices we face everyday. Its coming. I can fill it. One day we will all join together and rise up as one united world. Take the power from those greedy politicians, who look down on us like we are not worthy of their time. Those well-to-do people, that don’t give a damn about nothing but themselves and making more money. We will knock them off their high horses and they will watch defenselessly as we take over giving every human being the rights they deserve. The right to true free speech, the right to affordable healthcare, the right to affordable housing, the right to a free education, the right to cross boarders without being arrested or worse shot. I am ready for the revolution….are you? The revolution will not be televised so be listening to what’s going on around you. And according to a workshop at the US Social Forum the revolution will not be funded. Want proof the revolution won’t be televised. How much did you see on the news about the US Social Forum? All I saw was Paris Hilton getting out of jail, who cares? I don’t…her getting out of jail is not even remotely important compared to what was going on in Atlanta. The USSF was the first big step to the revolution. There are still a lot of steps to climb but we are well on our way. I had a lot of fun in Atlanta, learned tons, networked with adults and teens from all over the world, and took the huge dive into the revolution. You can get in touch with me at Teen DAWG. If you want to know more about the US Social Forum or just want to talk to me about something totally unrelated send me an email. Also if you have a MySpace, add Teen DAWG. We really want to network with as many people as possible that are interested in poverty issues. Sometimes you have to uneducate in order to educate.